As we know, aging comes in waves. One day we feel as good as we ever did, better. We are full of vim and youthful vigour. We are still 18 years old. The next day we are so exhausted we can barely drag our useless carcase around. I was recently teaching creative writing at BCU school in Central Kalimantan, Indonesian Borneo. 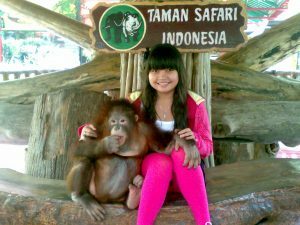 One of my students, Iga, a Dayak, the indigenous people of Borneo, told me that she wanted to write about “exploring my Dayak heritage”. One of the things she wrote was a biography of the modern Dayak hero Tjilik Riwut. He achieved legendary status because of his heroic exploits during Indonesia's struggle for independence after the WW2 when the Dutch returned and try to reimpose colonialism. 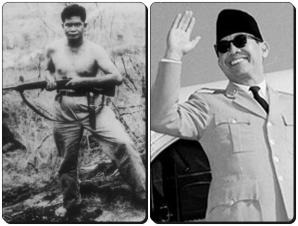 He achieved so much prestige and had so much clout that he was able to negotiate a deal with Indonesia's first president, Sukarno, that the Dayak people should be given a homeland. This led directly to the creation of Central Kalimantan and Tjilik Riwut also founded its capital, Palankaraya. So when you come to Palankaraya, you find many things named after Tjilik Riwut. The airport is named after him and the main highway, which runs north from Palankaraya, is also named after him. He was also responsible for having the traditional religion of the Dayaks recognised as an official religion in Indonesia. This required a certain sleight of hand. One of the five principles upon which the Indonesian constitution is founded is tolerance for the major world religions such as Christianity, Islam, Buddhism and Hinduism. The Dayak religion is really shamanistic and animistic, but by a little sleight of hand, Tjilik Riwut had it renamed, Hindu Kaharingan. While I am not an expert, it seems to me to have almost no common features with Hinduism . (Whereas in Bali, of course, the religion is recognisably Hindu.) But by renaming it as such, he hoped to give it equal prestige with the other religions and thus ensure its survival. As with other animistic religions (as with the Australian aborigines for example), the Dayaks believe that certain places are imbued with sacred power and often incorporate legends about ancestors and the spirit world. Conspicuous outcrops of rocks are often held to be sacred. Just a few kilometres up Tjilik Riwut Highway from where BCU school is situated, there is a collection of rocks known as Bukit Batu. These rocks were very important to young Tjilik Riwut who lived nearby. He often went to visit these rocks to meditate and gain strength and wisdom. 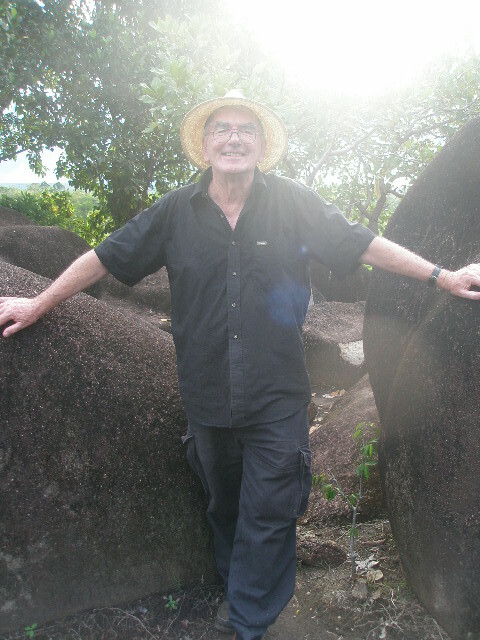 After having read Iga's account of the sacred rocks, I was very eager to see them, and more, to experience them. Was there some sacred power there that I would feel? Would I have some dramatic and transformative experience? So, one Sunday, an expedition was arranged. I was accompanied by Iga and her friend Fenny, students at the school, and by Hestu (from Java) and Emilie (from France), teachers at the school. We drove up Tjilik Riwut Highway for an hour to Bukit Batu. The rocks were quite a busy place. Obviously it is a popular Sunday spot for people from roundabout and there were lots of people picnicking as well as clambering about on the rocks. 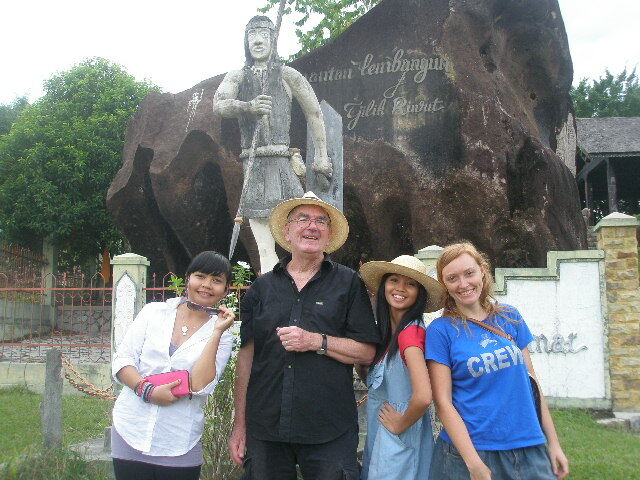 Bule (foreigners, white eyes) are common enough in this part of Borneo and I generally do not attract too much attention, but the sight of a decrepit old man accompanied by four vibrant and attractive young women was a cause of curiosity and we soon had a crowd of enthusiastic observers following us about. We went around the rocks and visited the various sacred spots, accompanied by a young guide. At this particular place you could gather wisdom. At another place you could gather strength. Then we came to perhaps the most famous and important place in the whole collection of rocks, a cleft between two rocks, which you are supposed to squeeze between. You make a wish and if you get through, your wish will be granted. The guide went first and got through quite easily. Then Iga and Emilie got through. Wisely, Hestu and Fenny did not essay the ordeal. Now, the gathered crowd, numbering several hundred, waited with bated breath. Would the aged bule, no longer as slim as he once was, also try to squeeze though the cleft? I felt it would be a severe loss of face if I did not. I felt I could not let down my nation and my people and so I tried to squeeze between the rocks. To the great excitement and amusement of the crowd I was soon stuck fast. I could not go forward and I could not go back. Then ensued a scene of great, hilarity, if you were not the one in the centre of it. One young woman pushing from behind, another young woman pulling from in front, the guide shouting out instructions (to pull in my stomach, lower my bum) and Emilie exhorting me to pray. Probably it was the prayer that did it, and I squeezed through and popped out the other side like toothpaste out of a tube. I was shaken. I was exhausted. I was trembling, embarrassed and humiliated. I felt I had lost all face. I had no more face. I was faceless. On top of everything else, I realised I had forgotten to make a wish before entering the cleft and my ordeal had been in vain, totally pointless. But there was worse to follow. You now had to scramble around a ridge of rock to continue your journey. The ridge of rock ran around a cliff face. Sure, it was only a drop of about five or six meters, but it looked to me that if you fell the wrong way you could easily break your leg, or even your neck. The guide and the young ladies scrambled gracefully around, but I could not do it. I just did not have the strength in my arms anymore, or the agility in my limbs, to get myself around this ridge. And I could not go back. 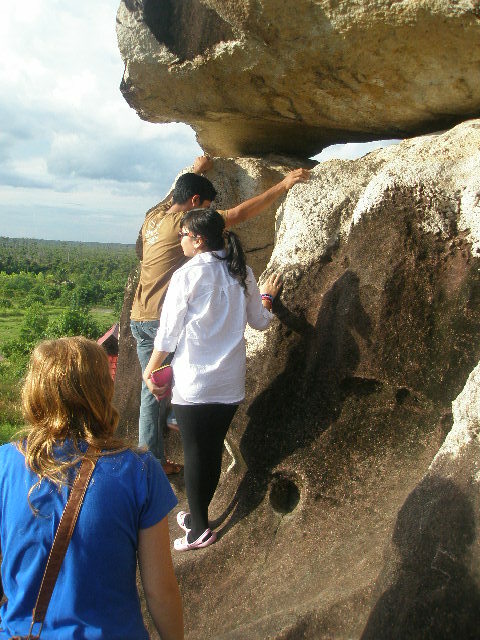 The guide said it was impossible to get back through the cleft. But once again with some people pulling, and some people pushing, and instructions called out, and prayers to God prayed, I did somehow clamber around the ridge and with trembling limbs came down from the rocks. The young ladies were very kind to me, but I could tell they had been embarrassed at having been part of these spectacles. I had not been cool. The coolest of these four young ladies is Fenny who is very slim and looks like a fashion model and always conducts itself with extraordinary natural cool. She is just incapable of any movement that is not elegant and charming. We climbed down off the rocks and photographs were taken. I was so drained, so exhausted, feeling so stupid, that I was incapable of posing nicely in a photograph. I was aware of myself standing there like a lump with dangling hands, while the young women arranged themselves in fetching attitudes. At one point, Fenny turned to me, and said quite kindly, "Could you please do something cool with your hands?" 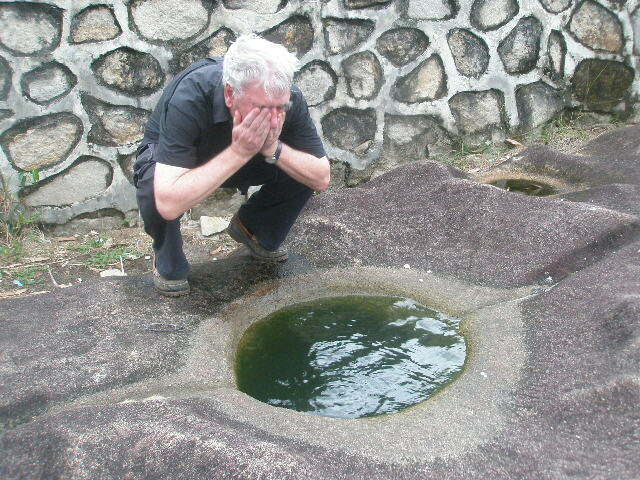 The last place to visit on our tour of the rocks was a hollow in a rock filled with greenish water. 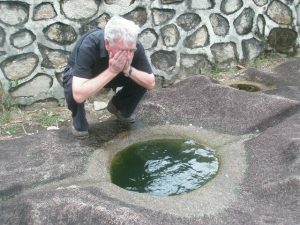 This is said to be filled by a spring which never dries out, not even in times of severest drought. You approach the rock, and ask permission to take water from it. You kneel by the little bowl of water and splash some on your face. It is supposed to be the Spring of Eternal Youth. I splashed some on my face. Later I saw the photographs the girls had taken of this white-haired old man crouching by the pool splashing water on himself. Who was it? That was not me! Surely not! I am still young! Barely eighteen! We were all rather subdued on the drive back to BCU School. I knew I had lost face with the young women. I had been an embarrassment. Of course, they were much too nice to say anything, but it seemed they had trouble looking at me or speaking to me; I knew some damage had been done to my prestige in their eyes. Why do I do these adventurous things? I could have just been an onlooker. I didn't have to do it. What was I trying to prove? What was the point of these exertions? Did I feel I had to make up for some ancestral or karmic misdemeanour? Was I labouring under a curse? Why did I ever feel I had to leave the safety of my home and the comfort of my couch? Unlike Tjilik Riwut, my visit to the rocks had not been a gathering of strength and wisdom, but just the opposite. It had been a revelation of weakness and stupidity accompanying the descent into old age. Still, I saw I had had a very real experience at the rocks and that was what they were all about. I had been confronted by a truth, a reality. It had been an ordeal, a rite of passage between a rock and a hard place. And isn't that life? Sometimes we get stuck and it takes a lot of energy to get unstuck and to move on? Sometimes there's a ridge we have to cross, and there is danger, but somehow we have to cross over, given all our inadequacies, even though it looks more like a mad, desperate scramble than the essence of “cool”. Perhaps to experience your weakness and inadequacy is an essential prelude to the gaining of strength and wisdom. Of course within a day or two the whole thing had been forgotten. My relationship with the young women was just as secure as it had ever been. Like an anvil dropped in the sea, the incident disappeared without trace, leaving no mark, no sign. Probably it is I alone who now recall it ever happened. And within a day or two I was right back to feeling like an 18-year-old again.